If you pull up your website and study it for a while, then you may discover that there are elements that are done very well and elements that need to be redone. The truth of the matter is that before many people read a single word on your website, they may be so turned off by its design that they head to your competitor’s site despite the fact that you have more information, better products, and outstanding prices. Before you let this travesty happen again, here are some pointers to consider. You can have the prettiest website on the internet, but if it’s not usable, then you’ve defeated the purpose of having a website in the first place. Your website should be self-explanatory. It should eliminate as many choices as possible while leading customers down the sales funnel until you get them to take the final action you desire. Make it easy for users to return to your home page so that they’ll never be completely lost. Eliminate any unnecessary stops along the way. Start by dividing your website into sections based on the way that users think. Doing A/B testing is a great way to find out what works best on your website. Then, use very few words to let users know what they’ll find on that part of your website. Remembering the F-shaped pattern that most users naturally use to scan a website, place the main navigation menu across the top of the webpage or down the left-hand side. Whichever choice you make, keep it consistent on all pages. Icons can be a great addition to your navigation menu, and they help to set your company’s personality quickly in the viewer’s mind. Choose a color for your navigation menu that helps it stand out from the rest of the webpage. Make sure to use language that connects with your target audience rather than industry jargon or cutesy phrases. Your website should be designed to show a customer what your product can do without requiring a lot of effort on his or her part. For example, if you’re trying to sell a great piece of software, then give the potential customer a demonstration before you ask him or her for an email address or personal information. Customers are more likely to give this information to you after they’re convinced that your product may help them. With more than 50 percent of users today using mobile devices to do web searches, it’s essential that your website be responsive. These websites respond by hiding, enlarging, and shrinking elements depending on the screen size of the device a person is using. 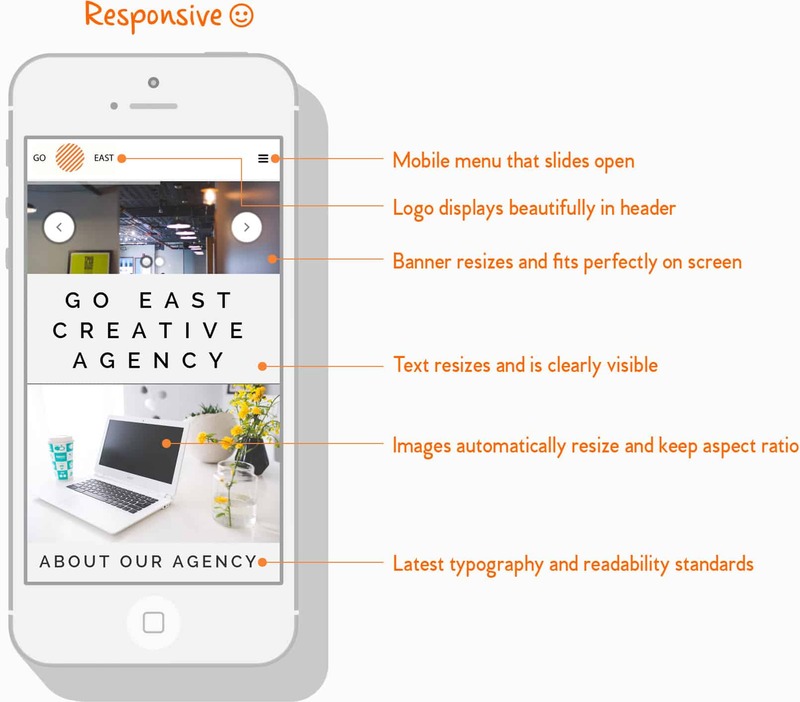 One of the keys to creating a responsive website is to think in terms of a fluid-grid layout where things appear in the right size on any device. Use a program to gather information about the user’s device. Then, apply CSS coding to create web pages that are attractive and useful. The added advantage of designing a responsive website is that Google and other search engines have announced many times that they’ll rate these websites higher. Therefore, more traffic ends up headed to your site when all other factors are equal, so responsive design is a sign of an excellent website. Most users are website scanners, and they scan in an F-shaped pattern. If you want the user to do something differently, then use visual elements to direct his or her attention. Use a font that’s easy to read and keep it consistent across all your pages. Choose a centralized theme, and stick with it on each of your pages. Keep your company’s colors and logo visible on all pages so that the user doesn’t wonder if he or she has left your site. While whitespace isn’t always white, make sure to use it effectively on your site. After all, the user’s brain needs time to process the information that you’re presenting to it. Whitespace is very effective at providing a calming influence on a website. It can be a very efficient way to guide the viewer’s attention to more important elements on the page. Keeping all these ideas in mind will allow you to create a website that’s organized, responsive, and efficient. Once you’ve arrived at possible ideas, test them so that you know which one connects best with your target audience. After all, your customers are the ultimate judge on whether your web design is attractive or something they want to bounce away from quickly. Check out this great episode from our podcast that discusses web design and how to improve yours!